In the 14th century, during the period of interregnum, the Ottoman Empire encountered a civil war that led a grand economic distress. Rebelled against the inequalities within the reign, Borkluce Mustafa who was one of the disciple of Sheik Bedrettin, began to work for a liberation struggle centered in Karaburun, Izmir. He as a leader, had a philosophy that encourages equality, participation, right of labor, unity and, thus his humanitarian attitude towards the people was deeply embraced and supported by Muslim, Jewish and Christian communities. Eventually, murdered for the sake of their philosophy and life purpose, Borkluce Mustafa, dervishes and his dear comrades showed a fierce resistance against the forces of the Empire (according to various sources 4.000 to 10.000 people were killed). On one hand, the main purpose of the project is to create an interactive sculptural landscape that embodies the symbolic representation of the Borkluce Mustafa’s dreadful journey and on the other, to originate a synesthesical involvement with the side. Otherwise stated, the reciprocal triggering process of the five individual senses of the visitors is one of the major concern besides the spatial emergence of the sculpture and its surroundings. 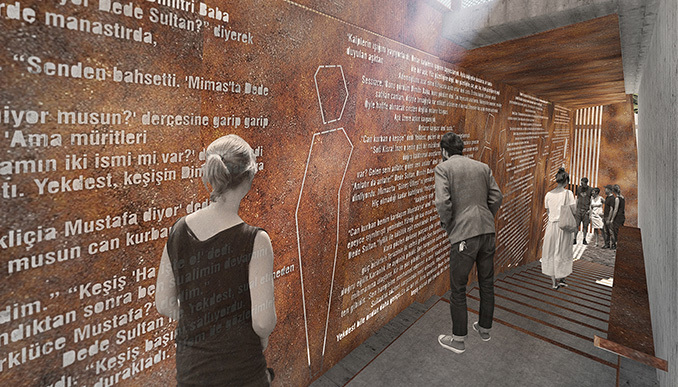 When viewed from different angles, various free-standing corten steel plates which are located on northern side of the site, creates a single figure that symbolizes the fight of Borkluce Mustafa and his companions as a whole; one single heart. These figurative elements that invite visitors to this magical landscape leads people towards the topographical sculpture that holds a spatial duality within itself; positive versus negative/ openness versus closure. The feelings of despair, torment and torture embodied within the dark and weary enclosed staircase. 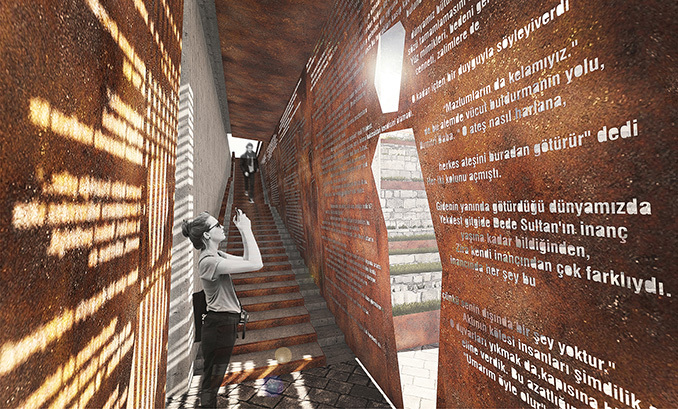 This enclosed staircase or otherwise stated the story tunnel does the honor to the journey of the thousands on its corten steel façades with cutout letters. 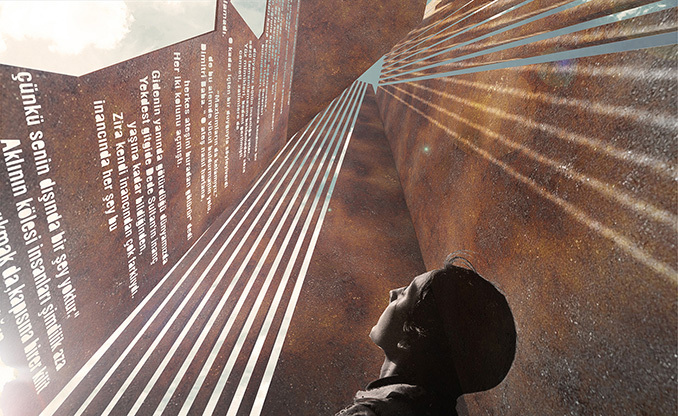 The vertical structure that terminates the story tunnel designed according to the movement of light and its spatial effects; darkened areas represents the obstacles, difficulties and impossibilities, meanwhile, god rays fallen from above stands for the hope and future. 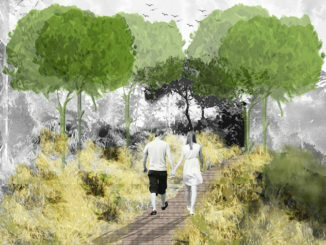 The materials and their relationships used in overall the project are adopted with the basic principle of simplicity and naivety. 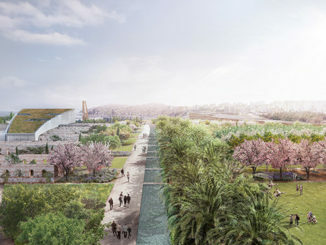 The local stones of the buildings façades which are also used as the pavement stone of the main plaza, the terraced green zones, and small plaza purposed to give a conceptual impact. In this sense, the local stone gives a spatial value and economical benefit that would be preferable in application. The facades of Turkish Aeronautical Association’s existing building has also been proposed to be covered with the same type of stone that are used at the facade of Cartoon House. 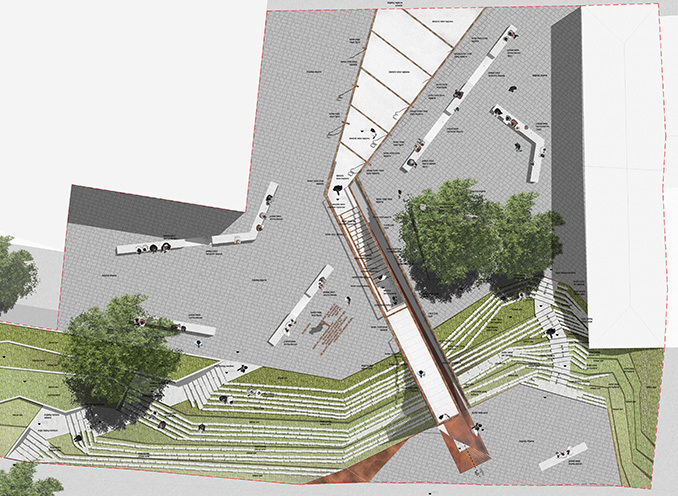 In order to maximize the visitors ergonomics, natural stone pavements on the terrace green areas and vertical circulation zones are used with their raw surfaces. In addition, the textured concrete emphasizes the impartiality and neutrality through its color and surface effect, and thus it acts as the backdrop of corten steel elements in all over the design. 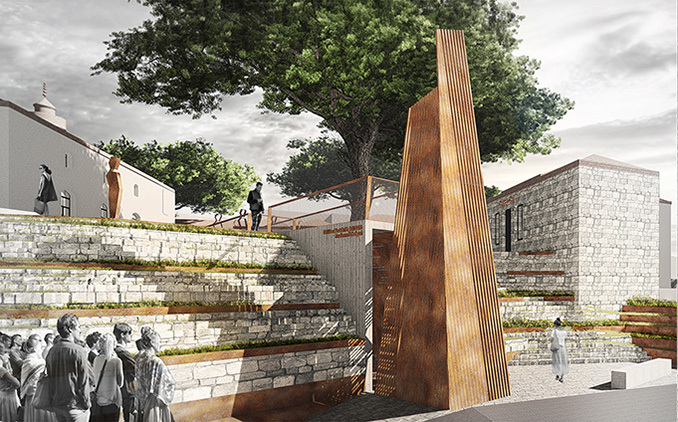 Meanwhile, the textured concrete with its naturalistic color helps to put an emphasis on the dramatic impact of the colors of corten steel elements that change all over the day. Besides the importance of aesthetic and functional use of corten steel as the main material of the sculpture, the semantic highlights can not be ignored. The lived and the living, the aged and the aging corten steel is the indispensable part of this unique artifact which holds a story lies from past towards the future. The rusty appearance of the design adapts itself to its surroundings via daylight in the day time, and via dramatical lighting in the evening.